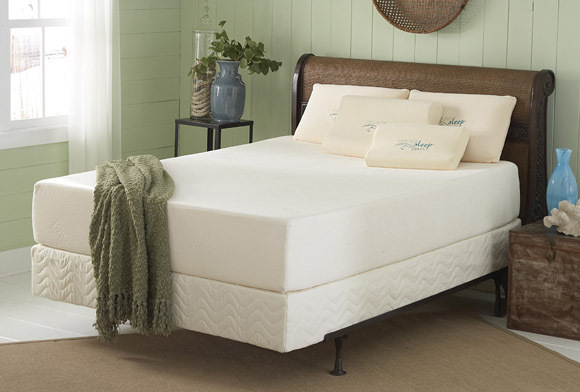 Nature's Sleep Visco Memory Foam Mattress collection will cradle and comfort your entire body from head-to-toe. The high quality, Next Generation Open-Cell Visco Memory Foam provides pressure relieving comfort from edge-to-edge for optimal support. Each mattress in our collection varies in density and foam height for a customized feel that benefits those who suffer from illnesses that cause sleeplessness (Fibromyalgia, Arthritis, Back Pain and discomfort). Visco Elastic Memory Foam or Memory Foam is the result of a NASA space project dating back to the seventies. Originally intended to be used in astronaut’s space suits to protect from the massive G-force pressures while exiting and reentering the atmospheric boundaries during missions. Memory Foam is the first-of-its-kind “Open Cell” polymer. This new class of foam reacts to the ambient and/or contact temperatures causing amazing molding and cradling characteristics. Regardless of size and body weight, it will naturally form to the body evenly over the surface of the mattress for a peaceful and restful sleep. Most people who awake with a stiff back, neck, and/or aches and pains, typically is the result of a metal based innerspring mattress. In addition to being either too soft, too hard or too old, innerspring mattresses can cause various points of pressure into the body. Is Nature's Sleep Visco Memory Foam mattress really the best support for stiff and aching joints? The pressures caused by an innerspring mattress to various joints and capillaries during a night’s sleep is considerable. Sleeping on a Nature's Sleep Visco Memory Foam mattress offers the best opportunity to reduce pressure points, because it will contour around the body rather than innerspring coils pushing against and into the body. Now is the time to buy a Nature's Sleep Visco Memory Foam mattress — which will constantly calibrate and recalibrate to every unique person’s body weight and shape.